30-Day Satisfaction Guarantee: Available on all MICHELIN® passenger and light truck replacement tires. If you're not 100% satisfied, bring the tires and original sales receipt back to the place of purchase within 30 days for a new set of tires. 3-Year Flat Tire Changing Assistance: A qualified service professional will change your flat and install your spare or provide towing at no charge. In case of a flat tire, simply call 1-888-553-4327 and a qualified professional will change the tire or provide towing up to 150 miles for free. Available 24 hours a day, 365 days a year in the U.S. and Canada. 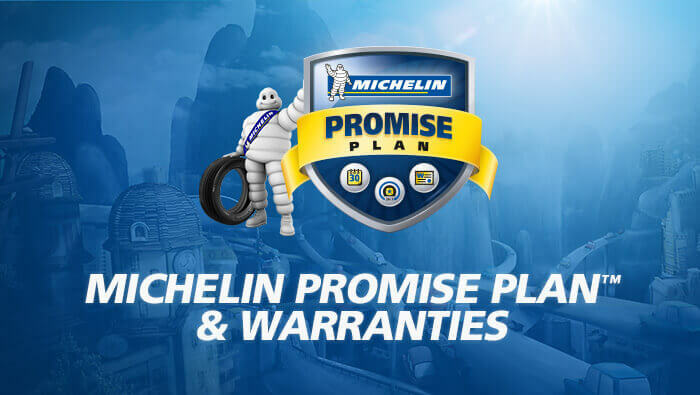 Limited Mileage Warranty: MICHELIN® passenger and light truck tires (replacement and original equipment) are covered by a limited warranty for tread wear. *Certain conditions and limitations apply. See the Michelin Owner's Manual for complete description and details. At Bayside Auto Works, we offer the complete line of MICHELIN® tire products as well as comprehensive tire services.